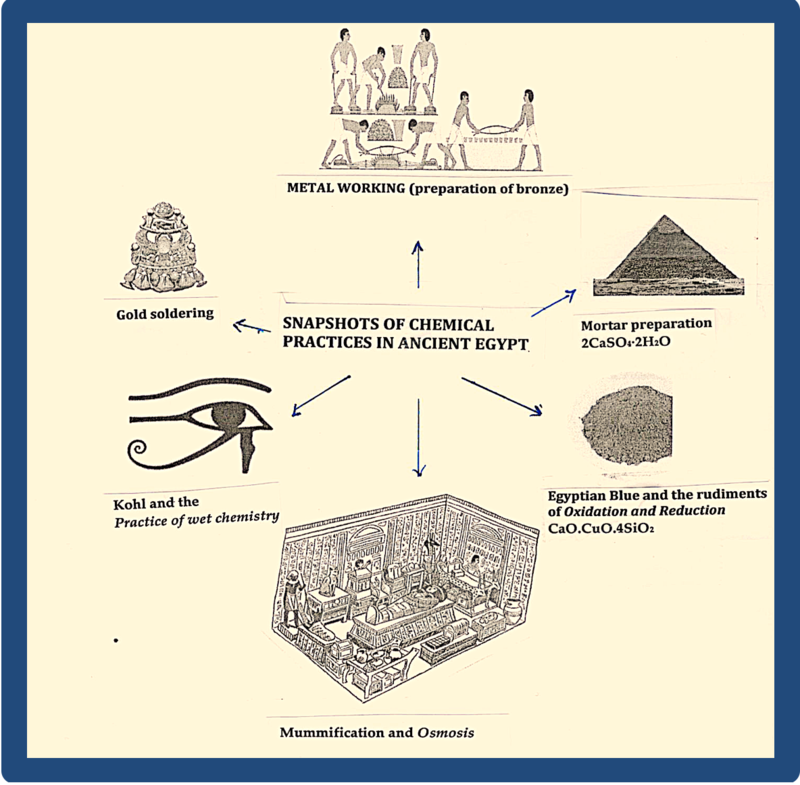 This article gives a historical overview of a number of chemical practices carried out by the Ancient Egyptians and shows that beyond being purely empirical, in more than one instance their methods suggest an understanding of the rudiments of modern day chemistry. A close analysis of some of their preparations indicates that Ancient Egyptians were familiar with the principles of oxidation and reduction, could control the pH of a solution and were successful in preparing novel compounds through a controlled technology of chemical synthesis. In the latter endeavor it is shown that these Ancient people embraced the scientific method, preceding Aristotle’s rejection in Ancient Greece of a purely deductive approach to scientific enquiry. Egyptian Blue, the only pigment synthesized by the Ancient Egyptians is also discussed, and attention is drawn to its potential future contributions to modern high-tech applications. Dr. Ragai, a surface scientist who studied for her PhD in London, is an emeritus Professor of Chemistry at the American University in Cairo. She has lectured extensively in the US, Europe and the Middle East to university and museum audiences on the scientific detection of forgery in paintings and on topics related to Ancient Egyptian Science in particular on colour. Owing to her additional interest in archaeological chemistry she became a consultant to the American Research Center in Egypt (ARCE) Sphinx project. She has served on the National Committee for the Study of the Sphinx, and from 2001–2008 was a member of the Board of Governors of the ARCE. Since 2008 Dr. Ragai has been a jury member for the l’Oreal-UNESCO, Women in Science award, founded by the Nobel laureates Christian de Duve and Pierre-Gilles de Gennes. As a faculty member in the Department of Chemistry of the American University in Cairo, she has chaired its Senate, its Department of Chemistry and was the Director of its Chemistry Graduate program. The recipient of several AUC Trustees merit awards, Dr. Ragai also received the School of Sciences and Engineering award for her role as chair of the Department of Chemistry and in 2013 she was awarded the university-wide best teacher award. She is the author of “The Scientist and the Forger” published by Imperial College Press and has just finished writing the second edition . She lives mostly in Cambridge, UK (with her husband) and partly in Cairo.